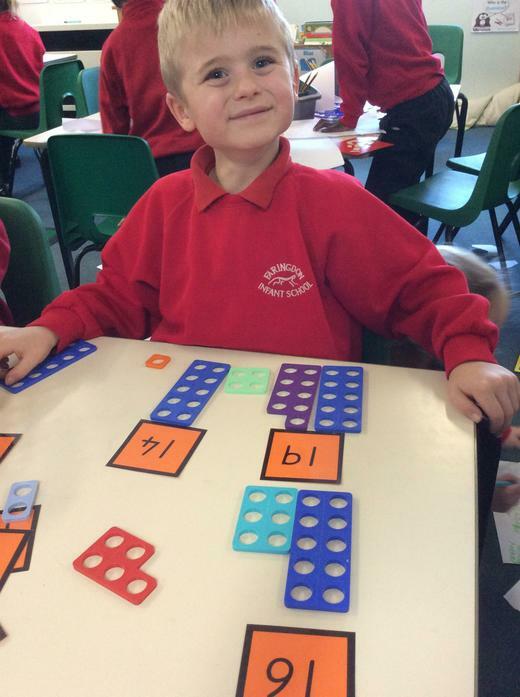 This term our puzzle piece is 'Healthy Me'. 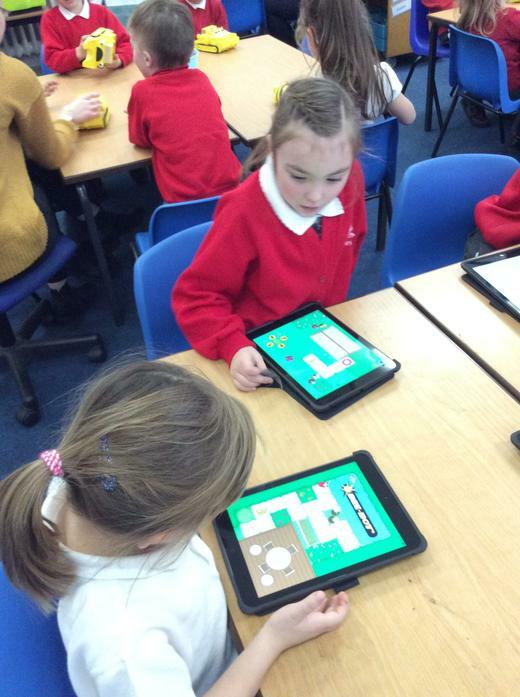 Please find more information about Year 1 Jigsaw lessons in the Useful Information section, within the Parents Tab. 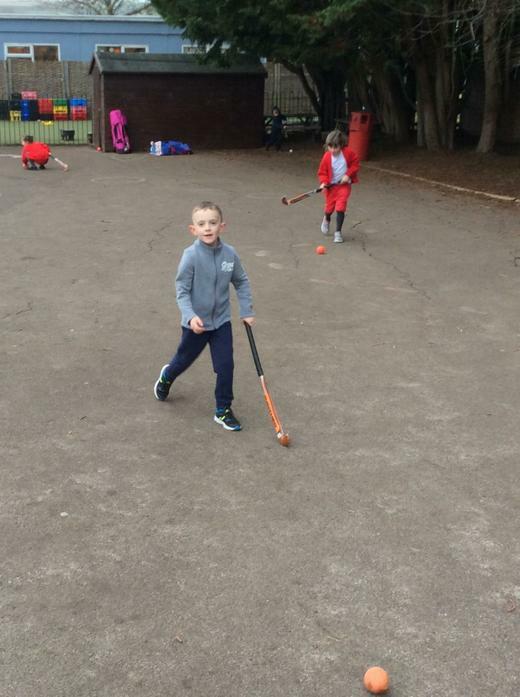 Thank you to all the parents that attended the workshop and we hope you found it useful. 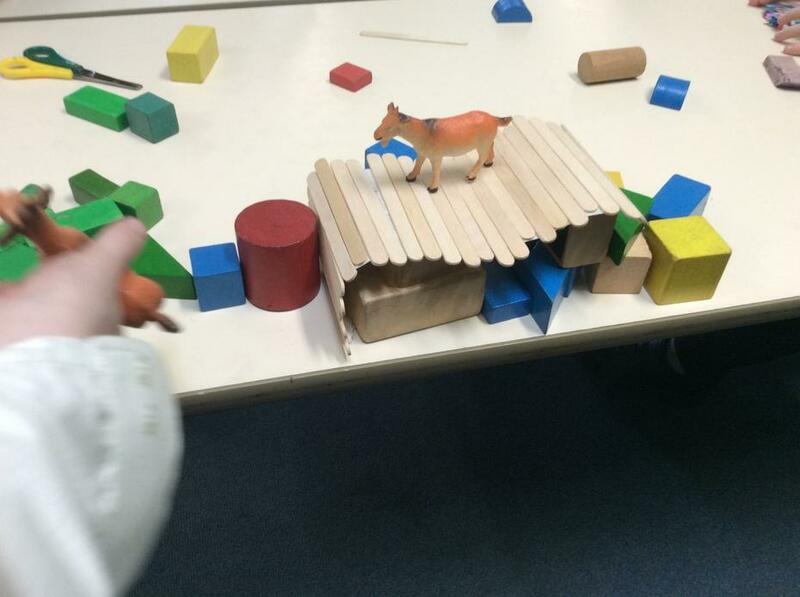 The powerpoint used at the workshop is below. 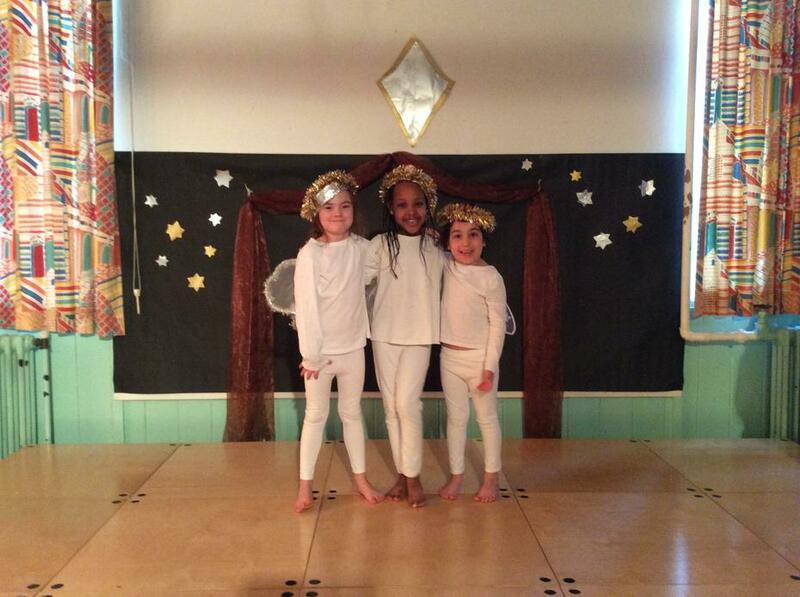 Parent Overview - Term 2 - Why isn't everyone afraid of the dark? 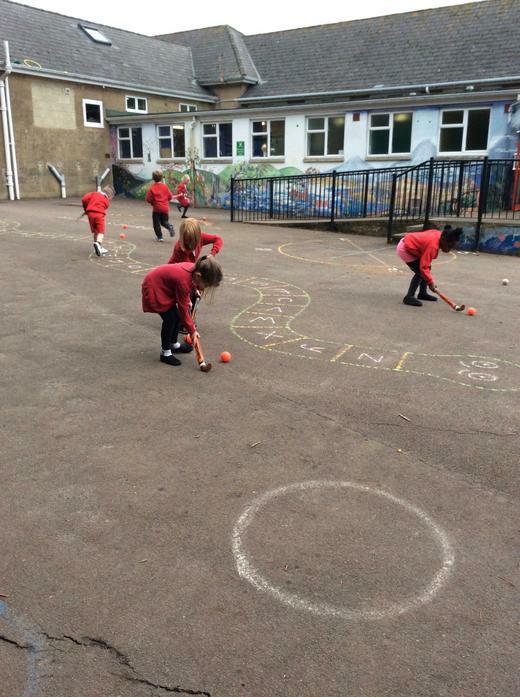 Home Learning Term 3 - What would the Jolly Postman find in Faringdon? 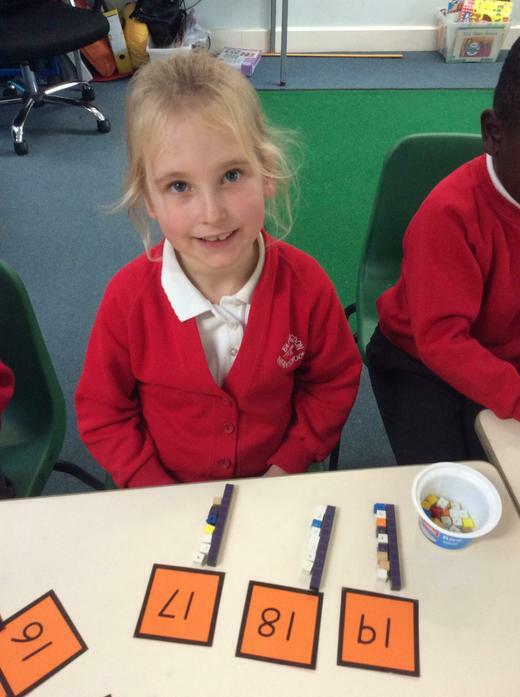 Home Learning Term 2 - Why isn't everyone afraid of the dark? 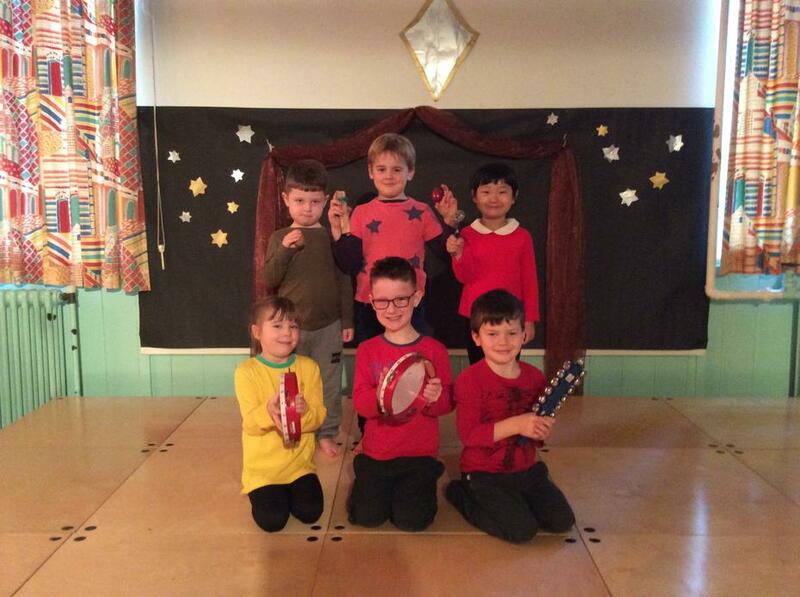 To celebrate the start of our new topic 'What would the Jolly Postman find in Faringdon?' 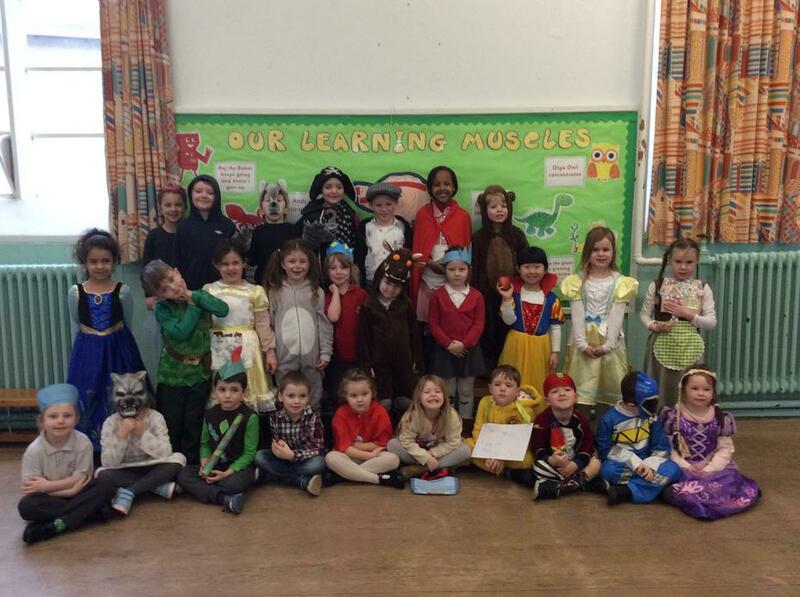 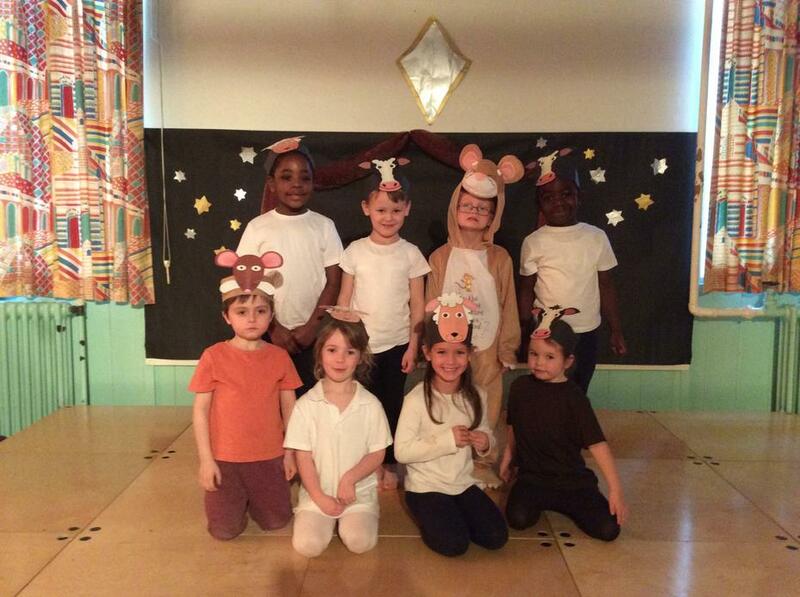 Year One came to school dressed up as characters from traditional tales, because the Jolly Postman delivers letters to characters like Goldilocks, the three bears, Cinderella, the Giant from Jack and the Beanstalk and the witch from Hansel and Gretel. 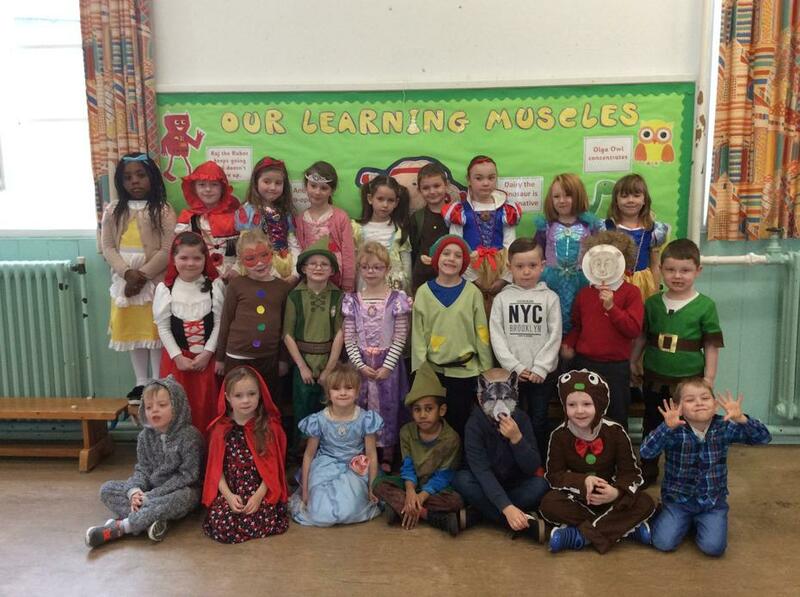 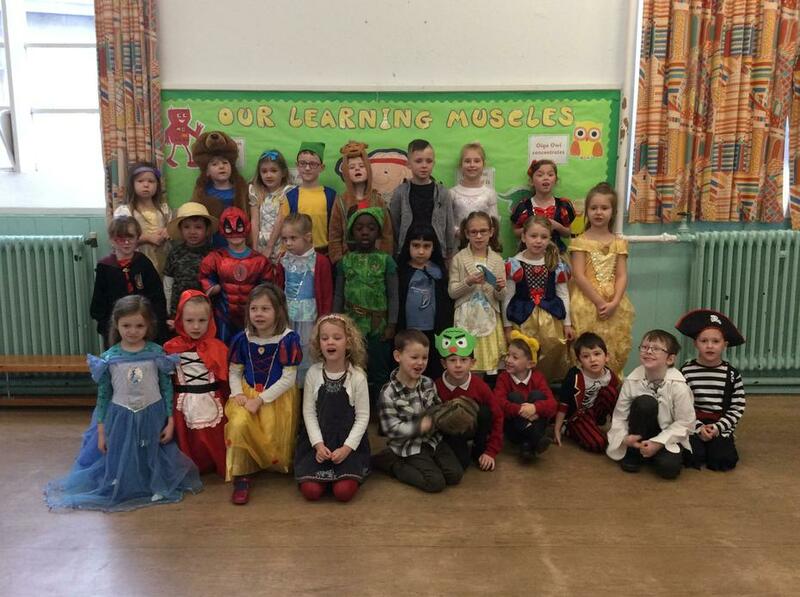 Everybody looked fantastic dressed up - we had bears, Gingerbread Men, witches, Snow White, Beauty and the Beast, Jack from Jack and the Beanstalk and many more. 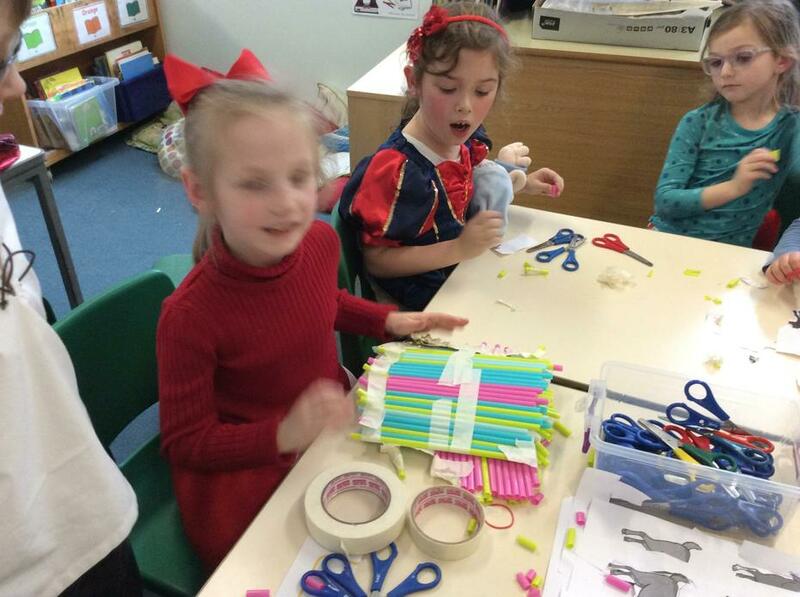 We also did some challenges such as building a bridge for the three Billy Goats Gruff, designing a gingerbread house for the Wicked Witch and designing and building a new chair for Baby Bear. 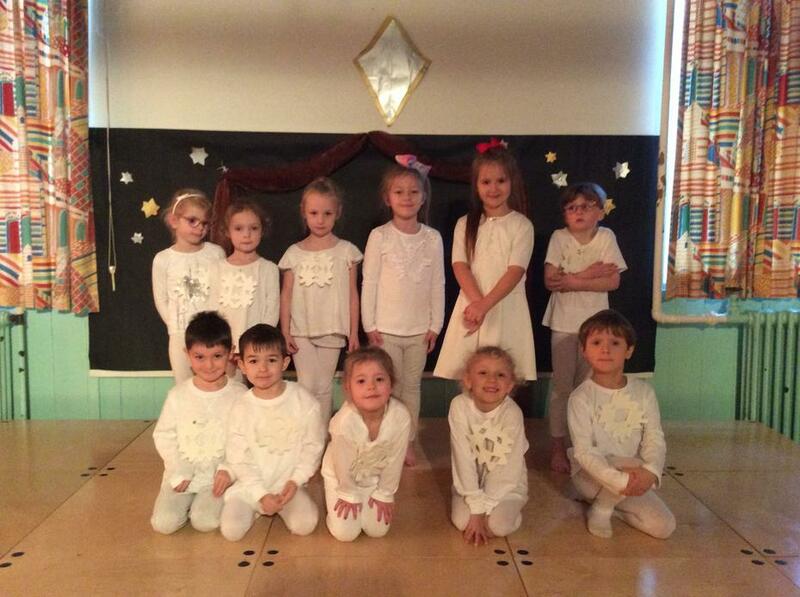 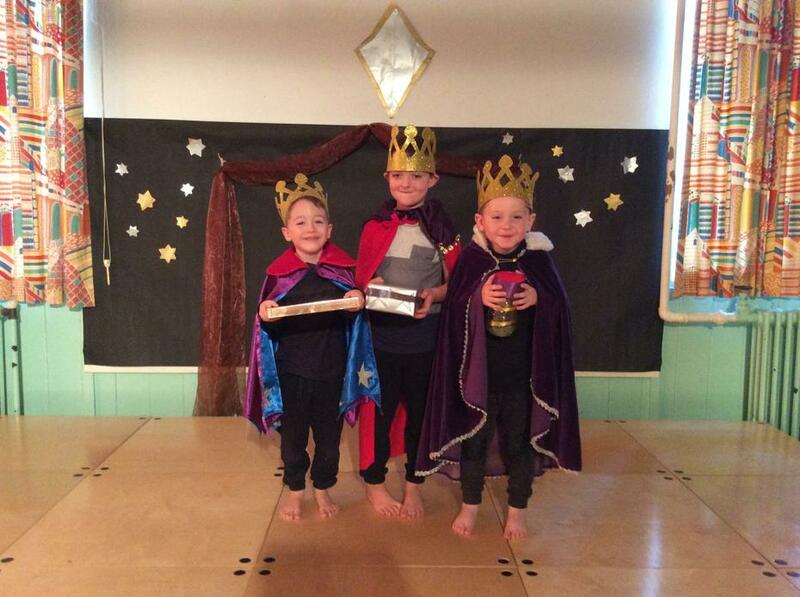 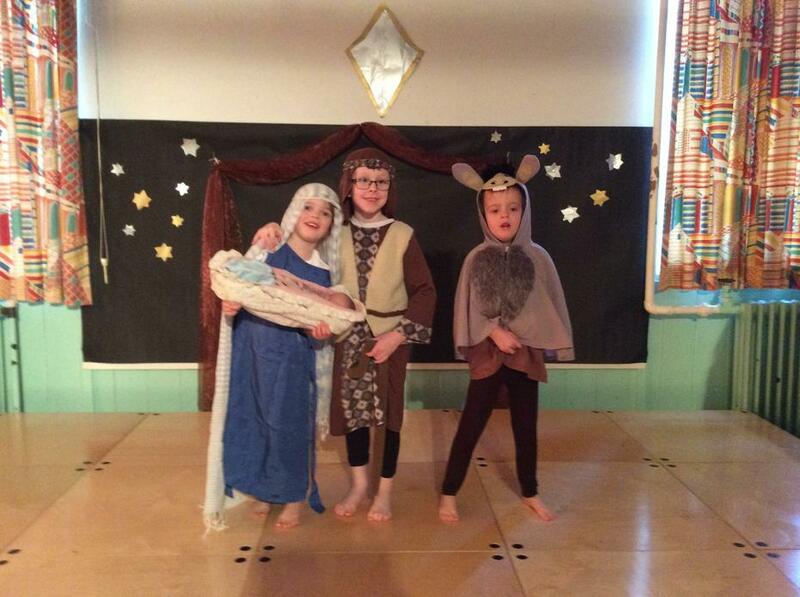 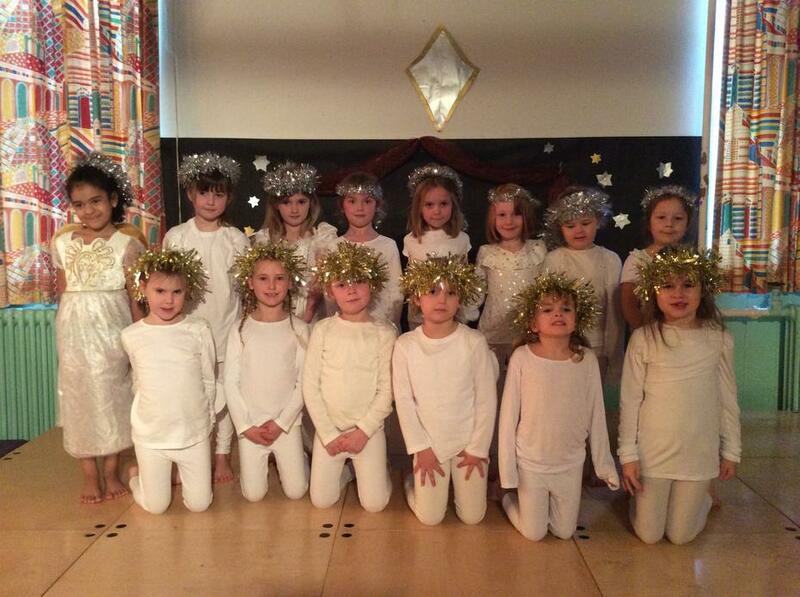 We have been busy practising and rehearsing our Christmas Nativity play called Whoops-a-Daisy Angel. 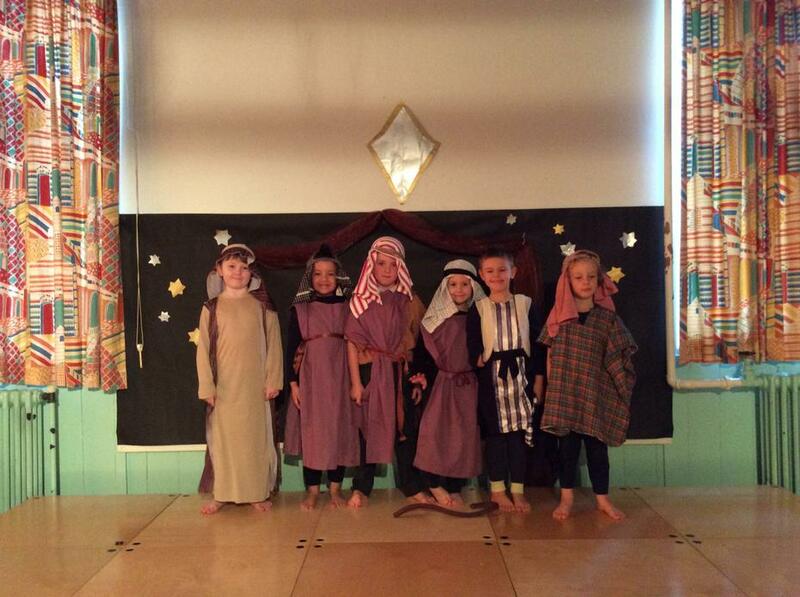 Some of us were playing instruments in the band, some children were in the choir and we had children who were narrators or who danced and acted on the stage as Mary, Joseph, the donkey, stable animals, snowflakes, shepherds and angels. 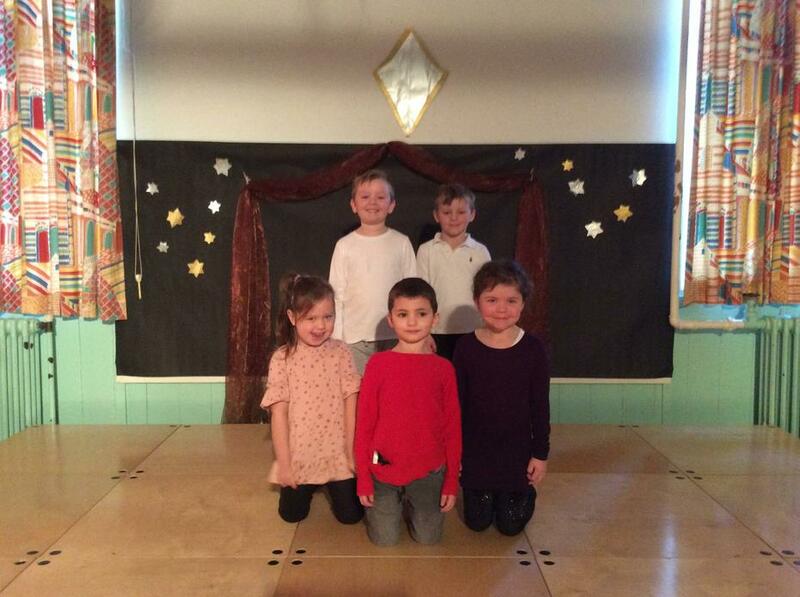 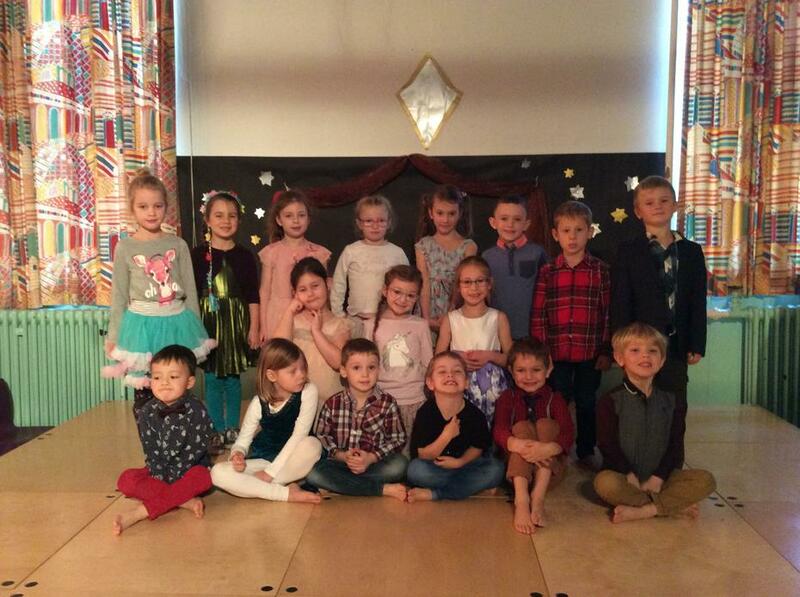 Everyone was fantastic and made all the teachers and grown ups very proud during our performances. 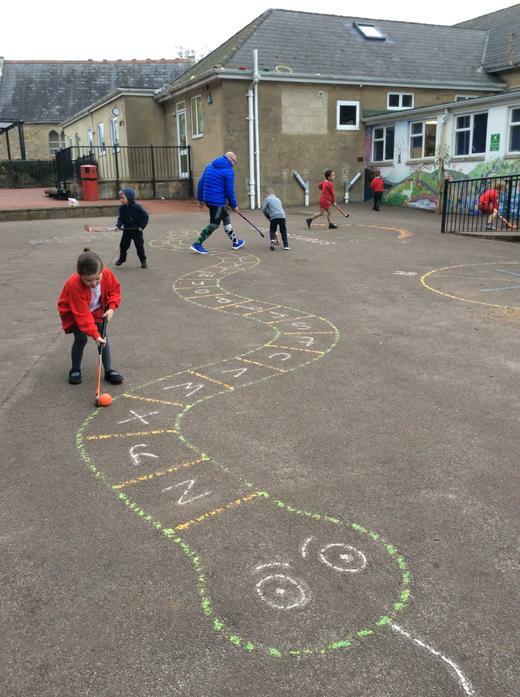 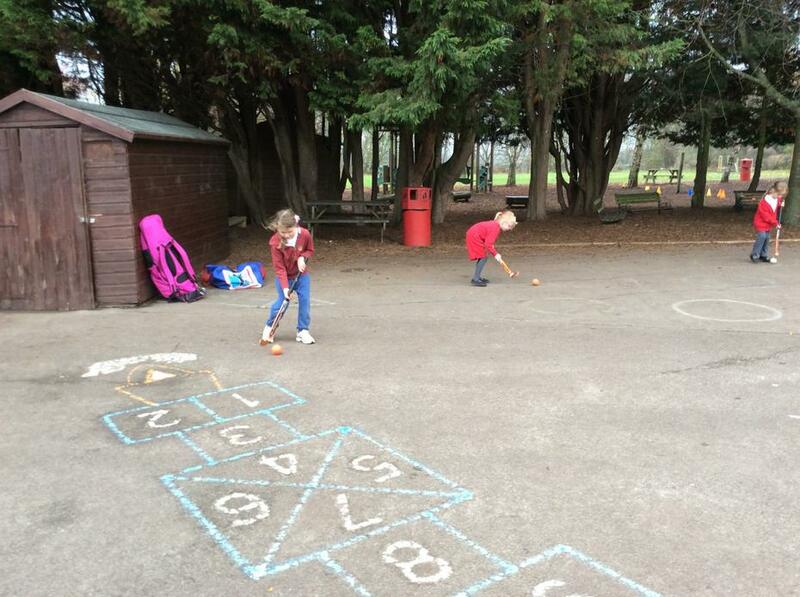 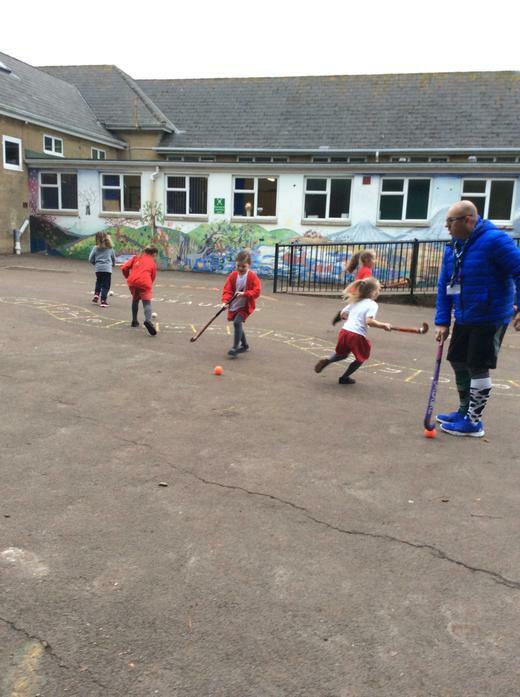 This term we have been lucky to have Hockey coaching for some of our PE lessons. 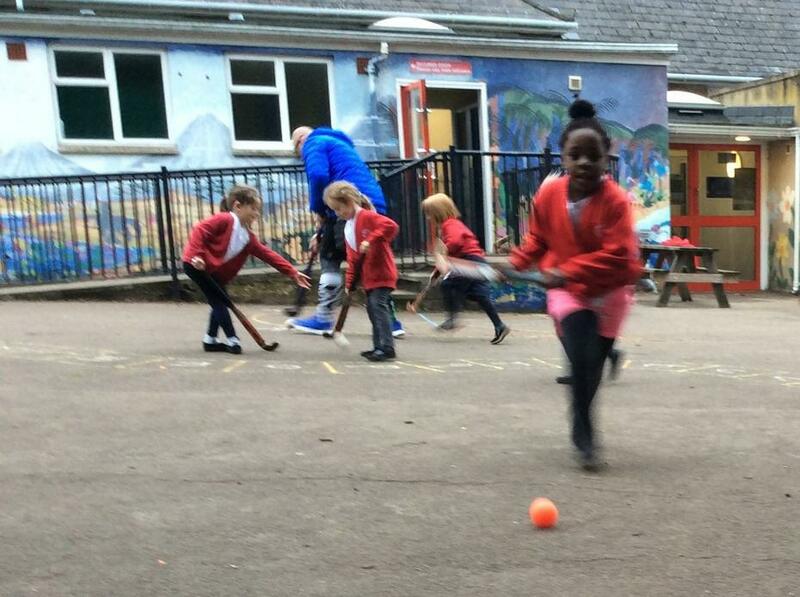 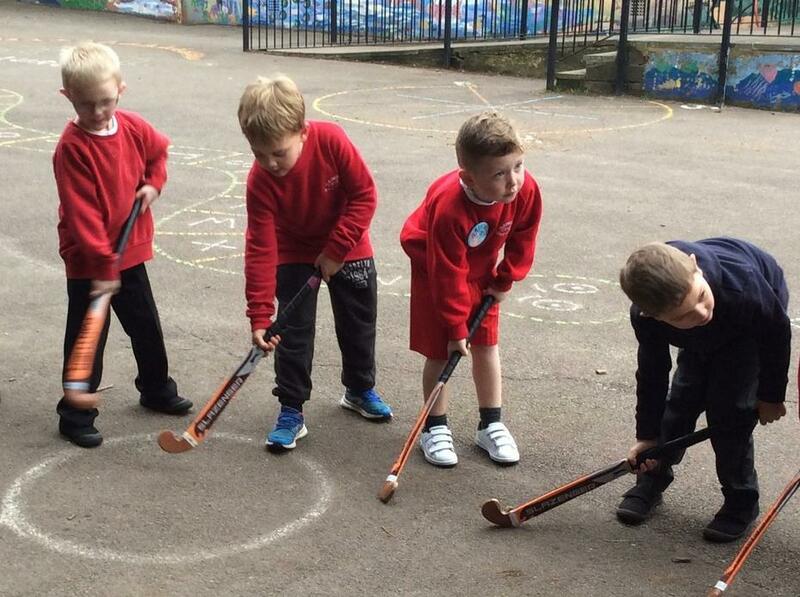 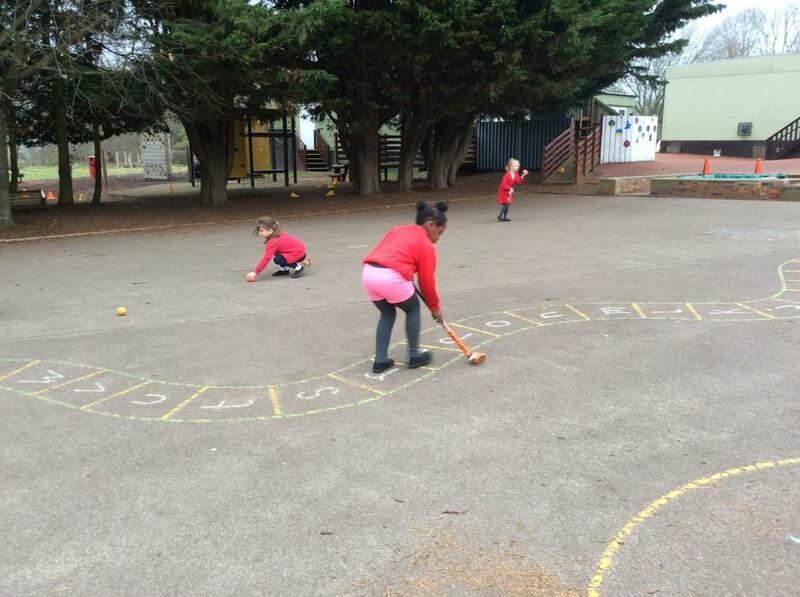 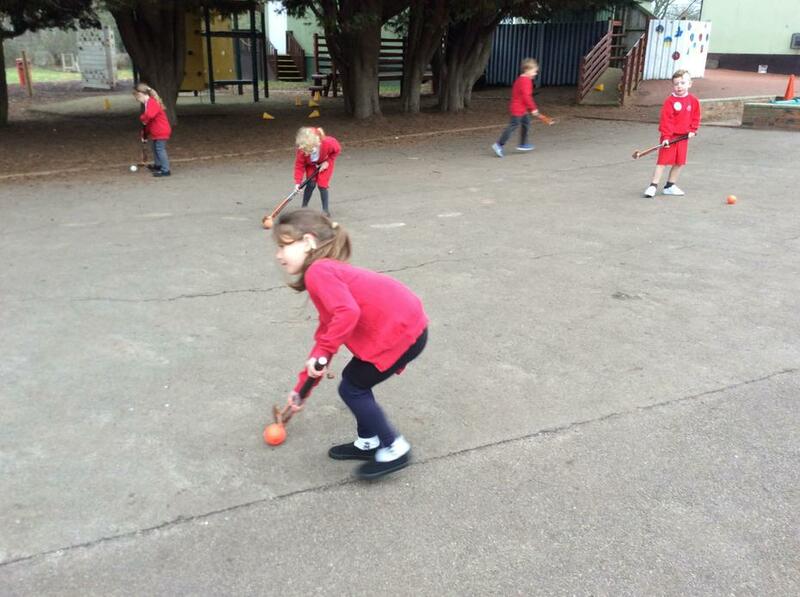 We have been learning how to hold the hockey stick correctly and how to dribble and move the ball with our sticks. 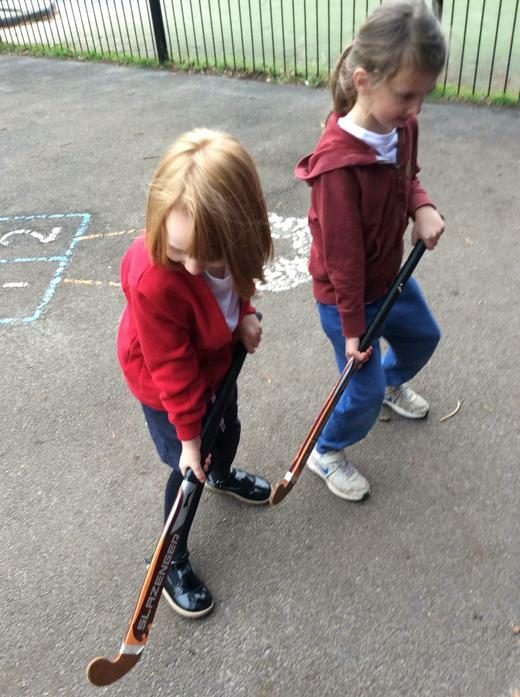 We were very impressive at how quickly we managed to hold the stick and stand in the correct position and were quickly learning how to gently take the ball from each other. 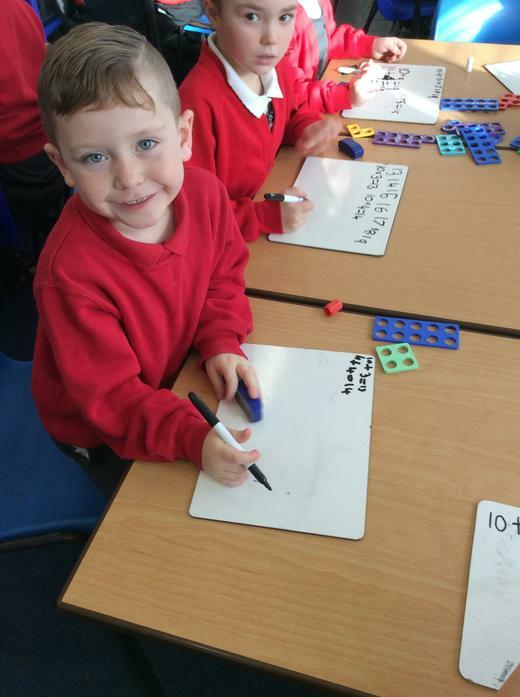 We have been exploring how the teen numbers have got 1 ten and different numbers of ones. 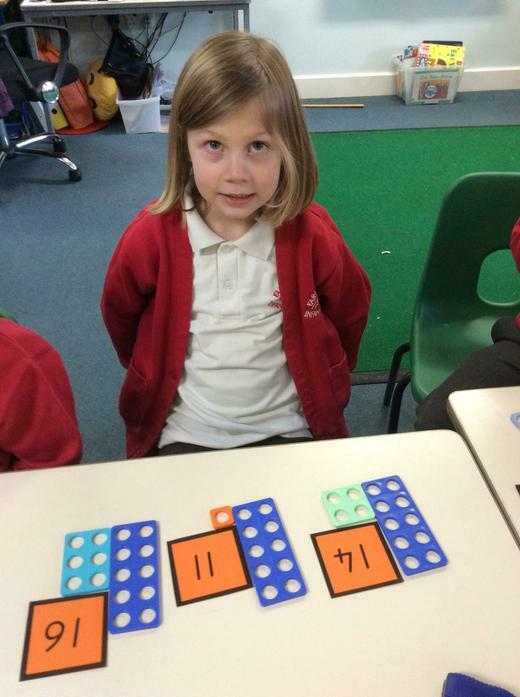 For example 16 has got 1 ten and 6 ones and 19 has got 1 ten and 9 ones. 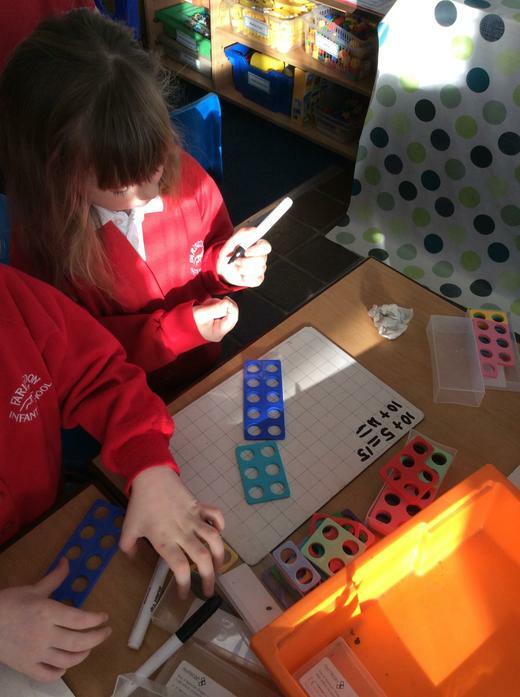 We have been using different equipment to help us show how many tens and ones the teen numbers have got. 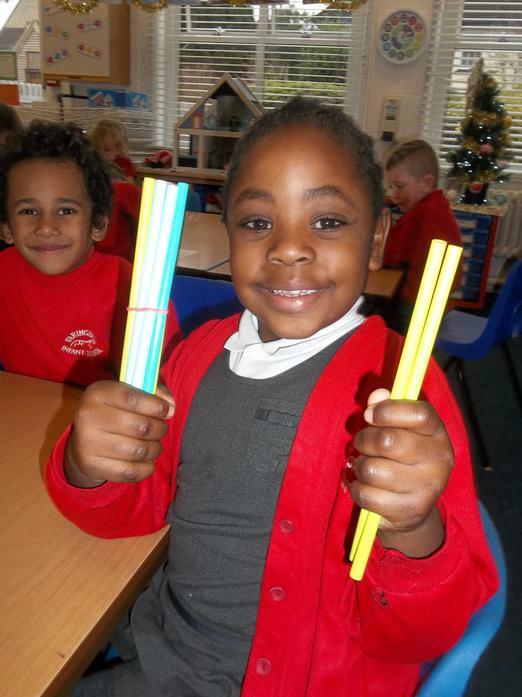 For example we used Numicon, Dienes and we even used bundles of ten straws and individual straws. 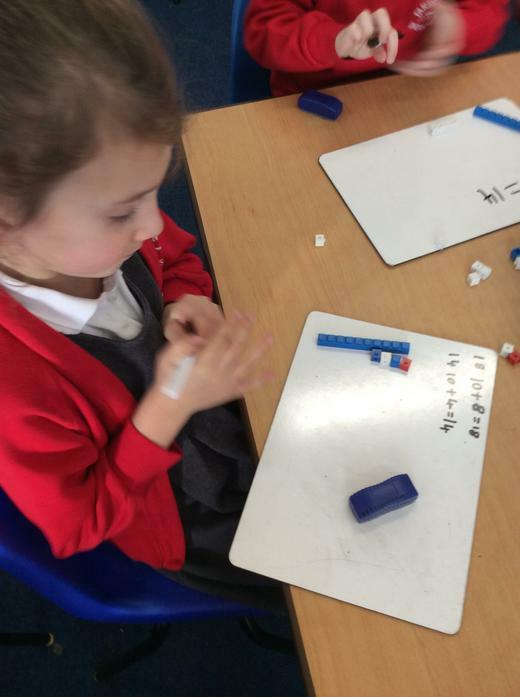 We are becoming confident mathematicians as we explore place value. 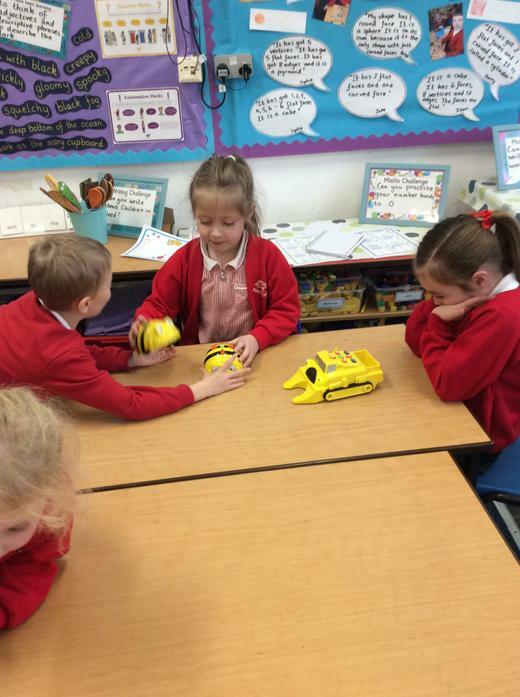 This term we have been learning how to give Bee-bots special instructions called algorithms to tell them what to do. 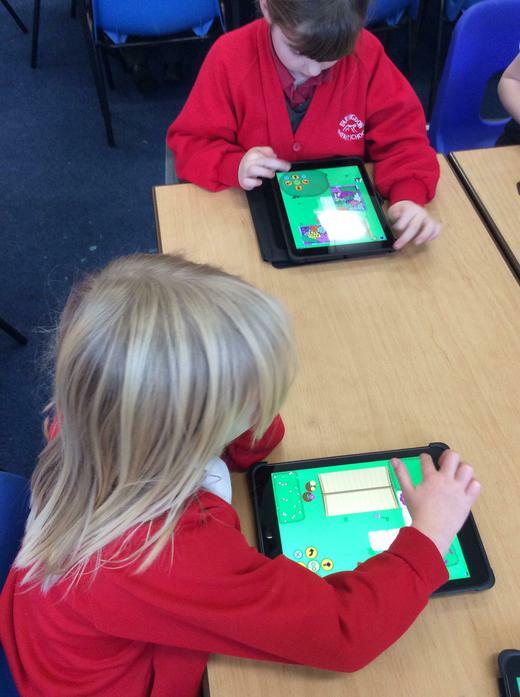 We also learnt that when we make a mistake it is okay - we can improve and correct our algorithms by 'debugging' it. 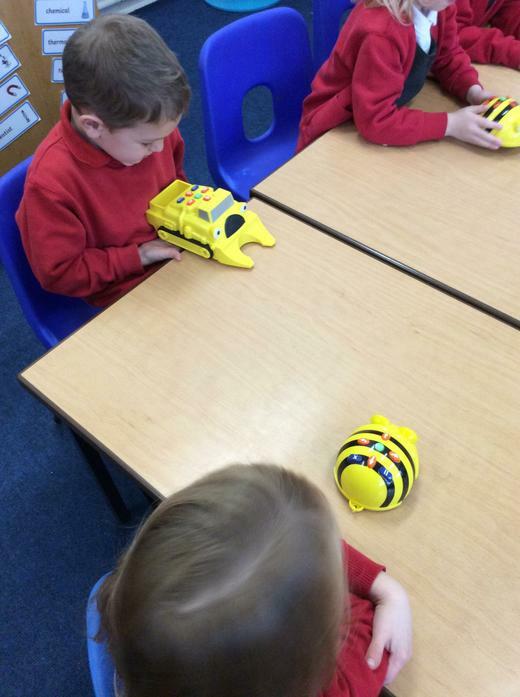 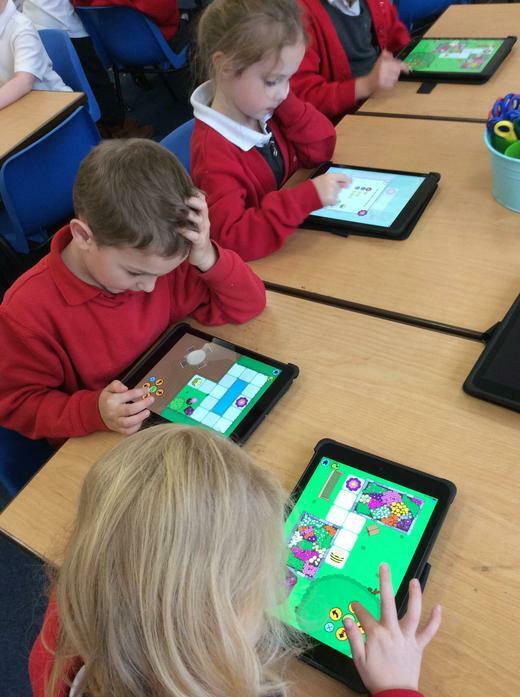 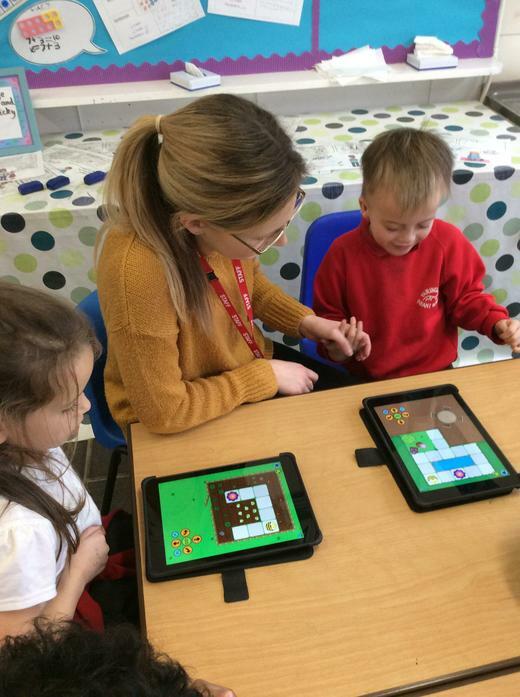 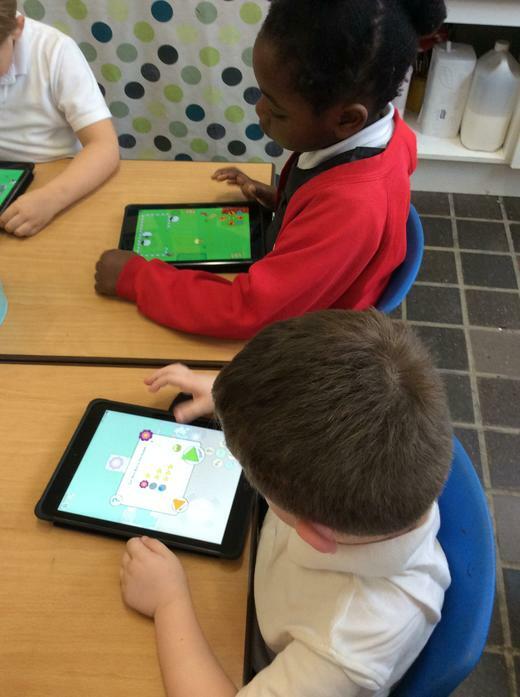 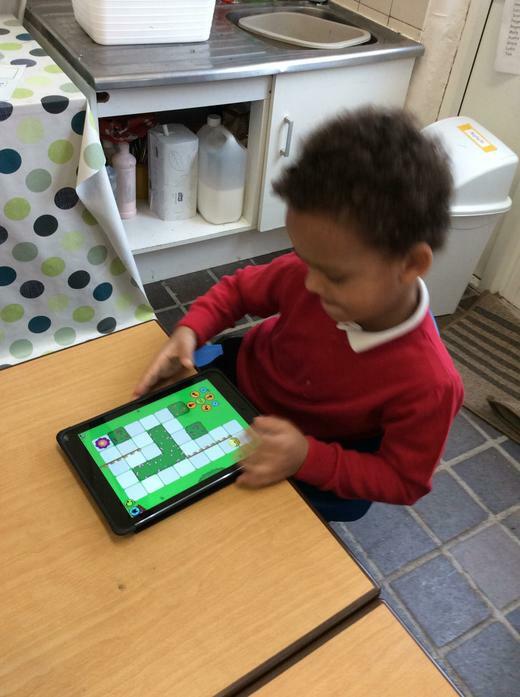 We enjoyed using the Bee-Bots and even had a go at directing the Bee-Bot on the screen using the Bee-Bot app on the iPads. 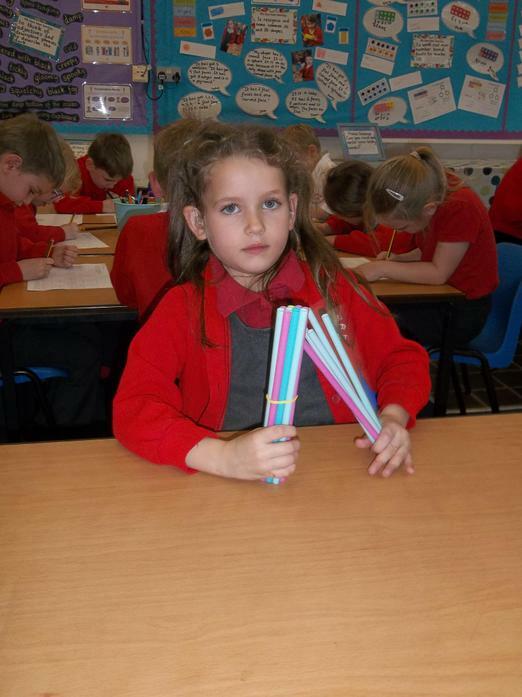 We have been learning how to write instructions. 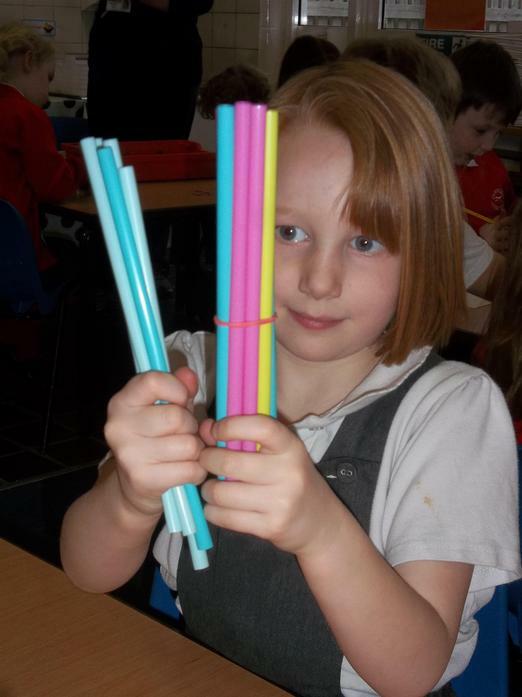 First we explored instructions and their features. 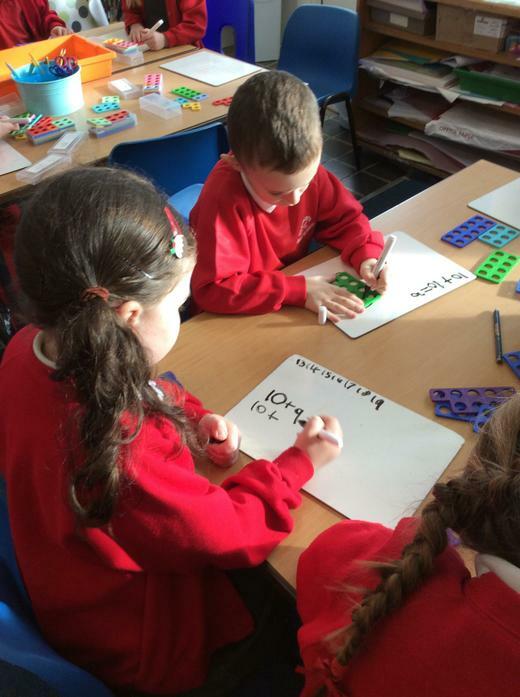 We learnt that instructions use imperative verbs which are bossy doing words that tell us what to do. 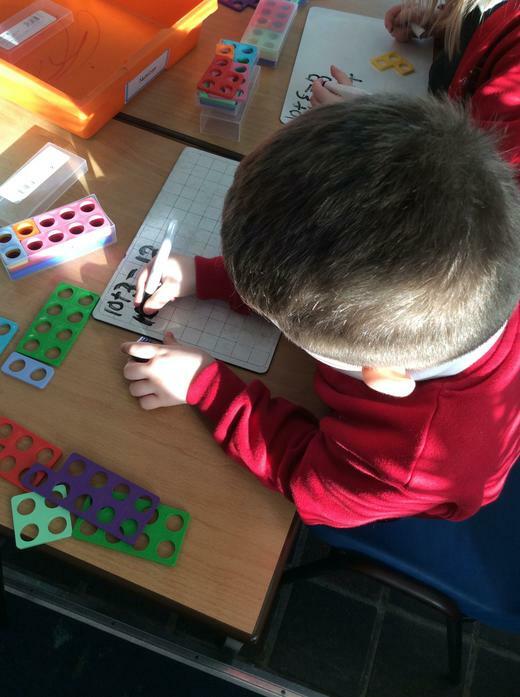 We also learnt that it is important to put instructions in the correct order otherwise you might make a mistake if you did it in the wrong order. 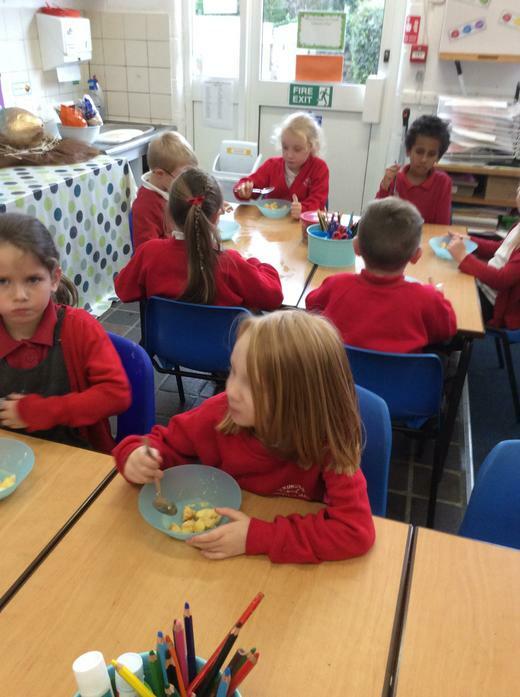 We then had a go at making apple crumble. 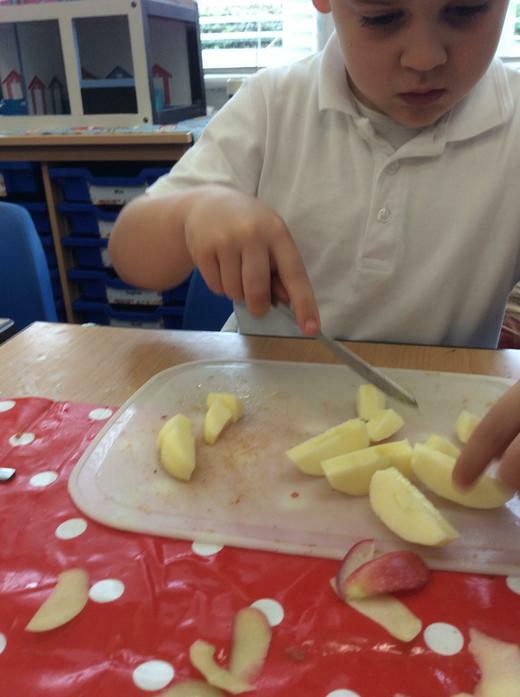 We peeled, chopped and microwaved the apples. 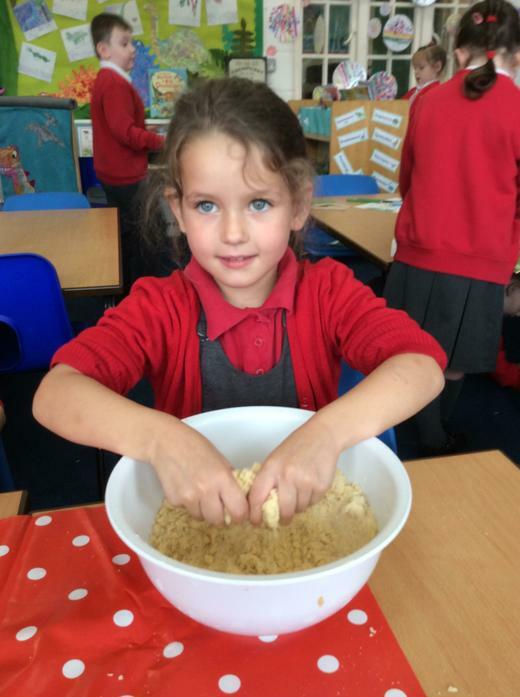 Then we made the crumble mixture and put it on top of the apples in a dish. 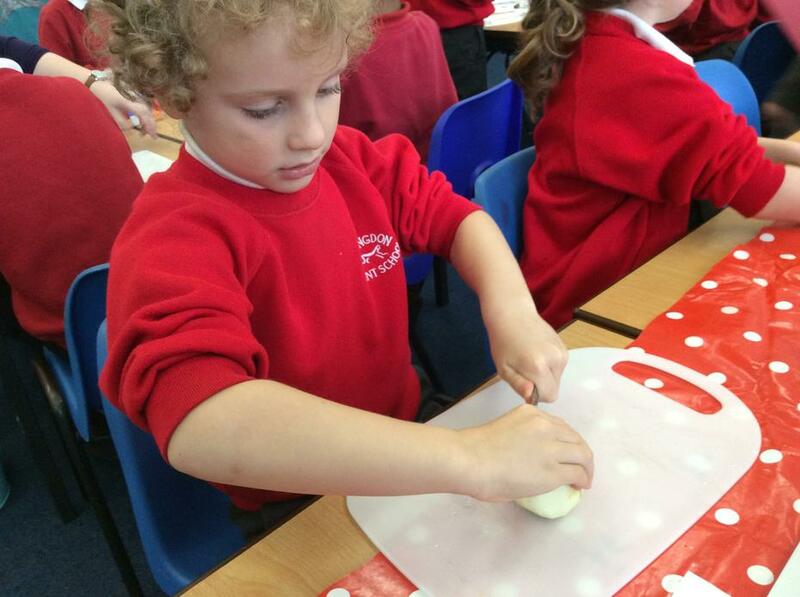 We then cooked it for 30 minutes in the oven. 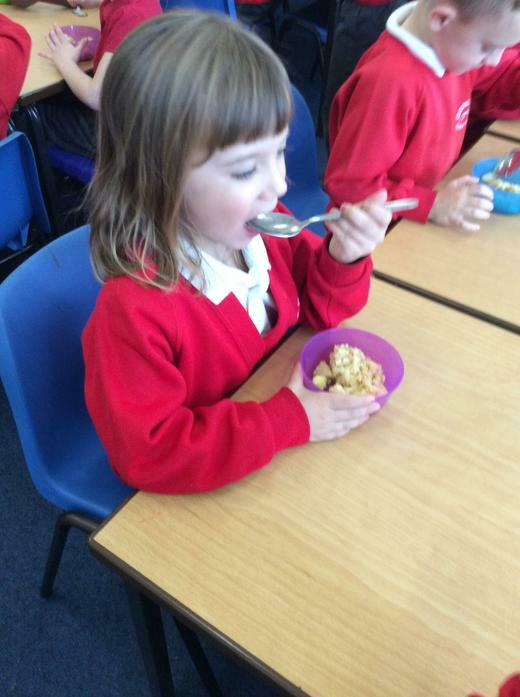 We had a great time eating it - it was so delicious! 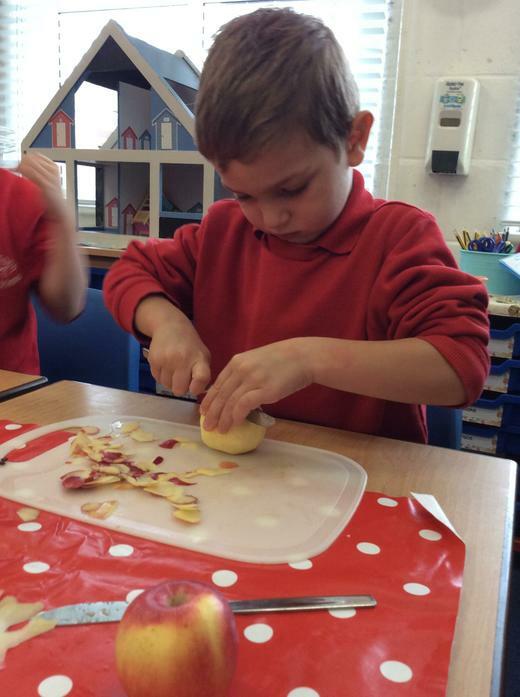 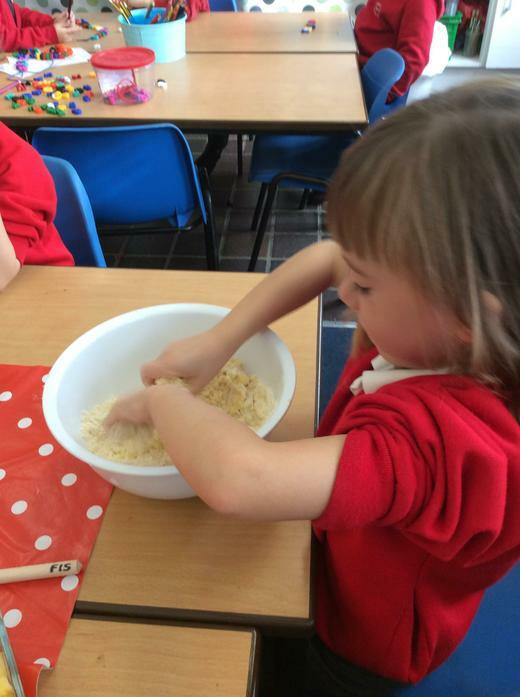 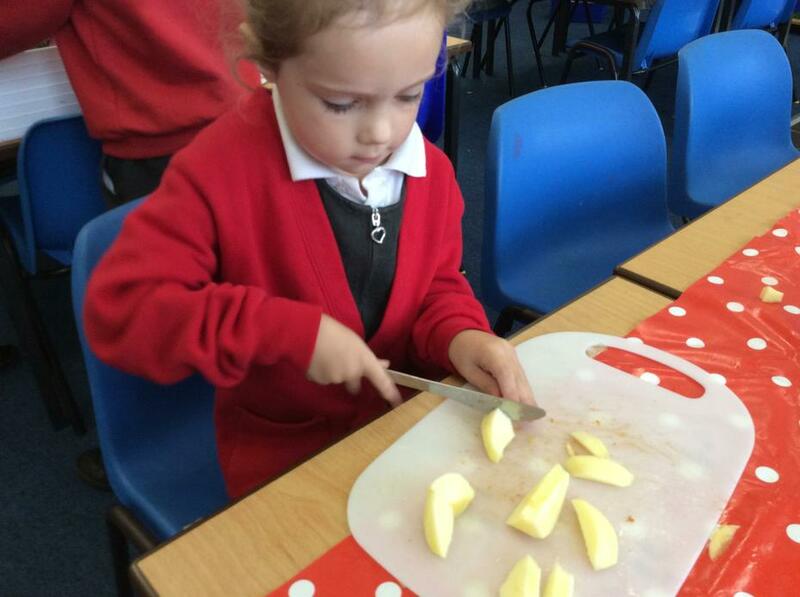 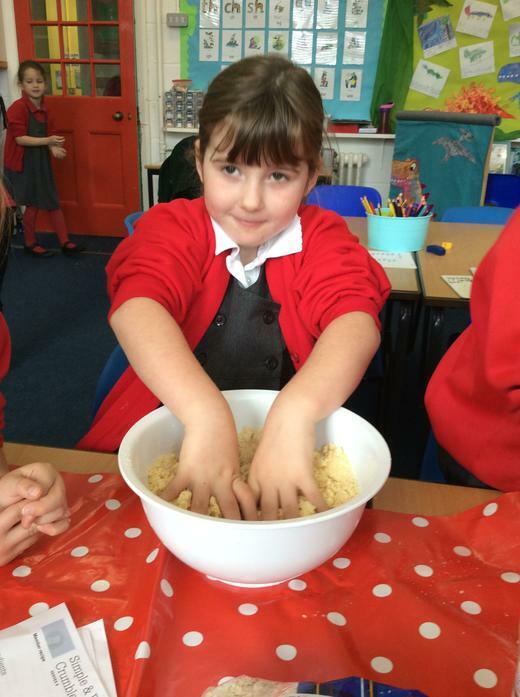 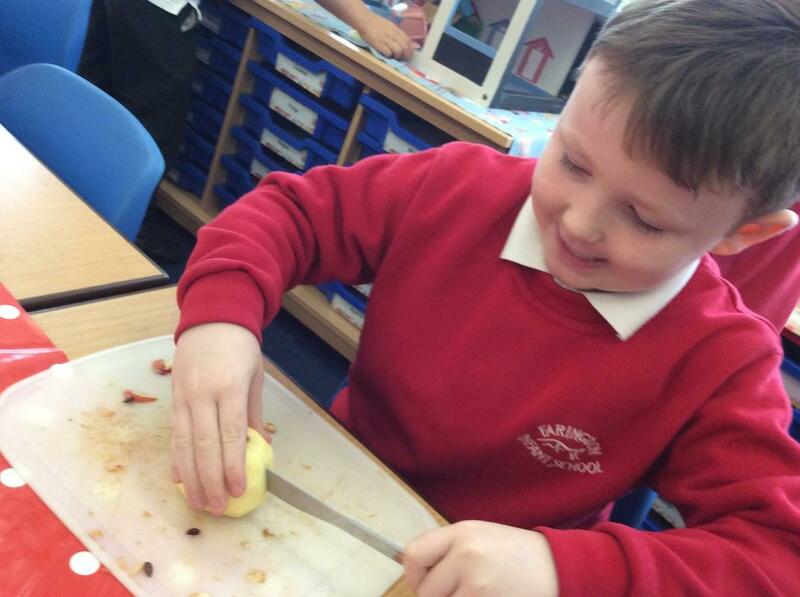 We then wrote instructions about making apple crumble - we did a brilliant job because we could remember exactly what we did when we made our own apple crumbles. 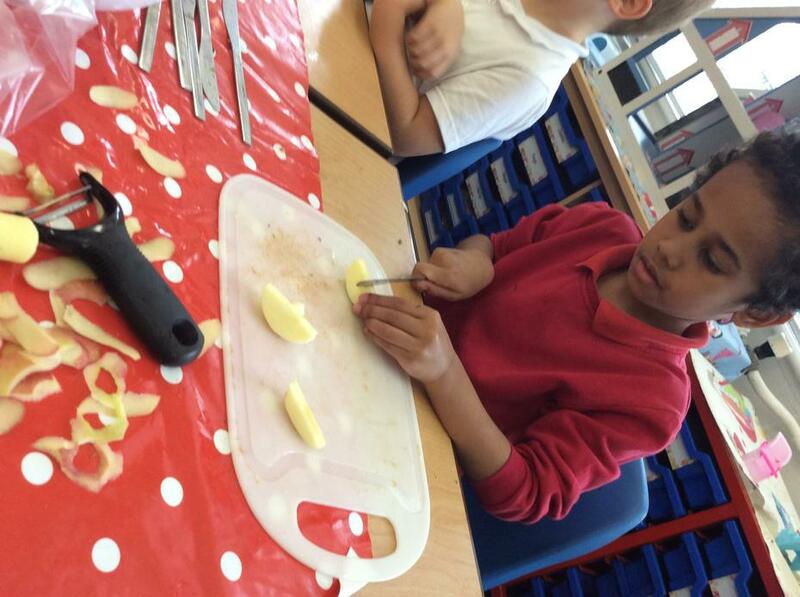 Who has made this mess? 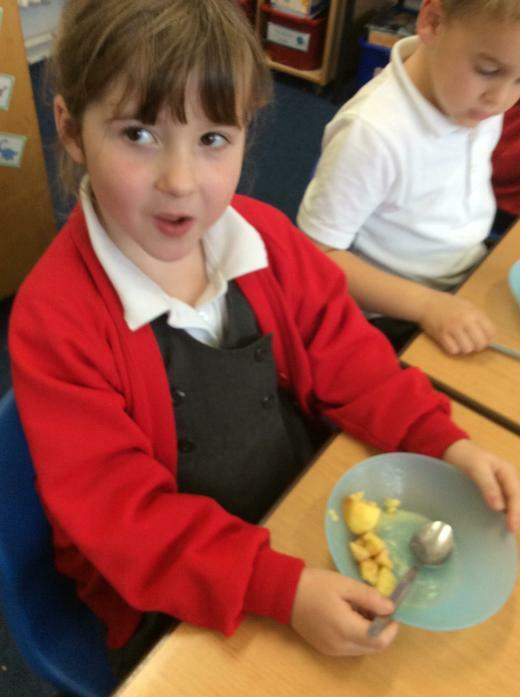 We found a giant egg on a nest. 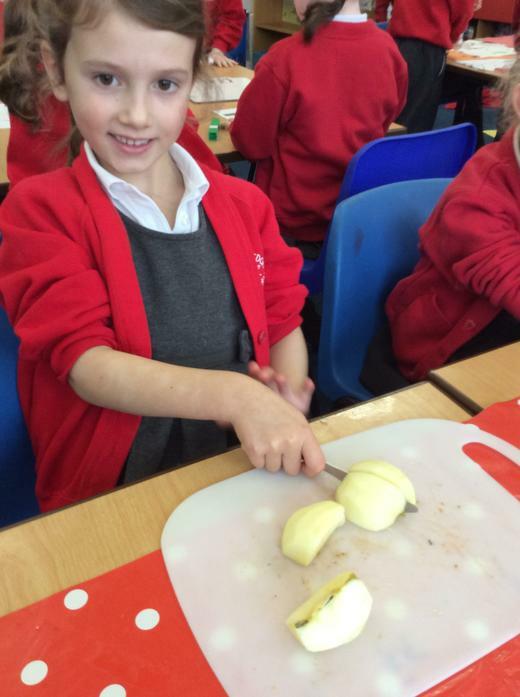 Oh no - is that we think it is? 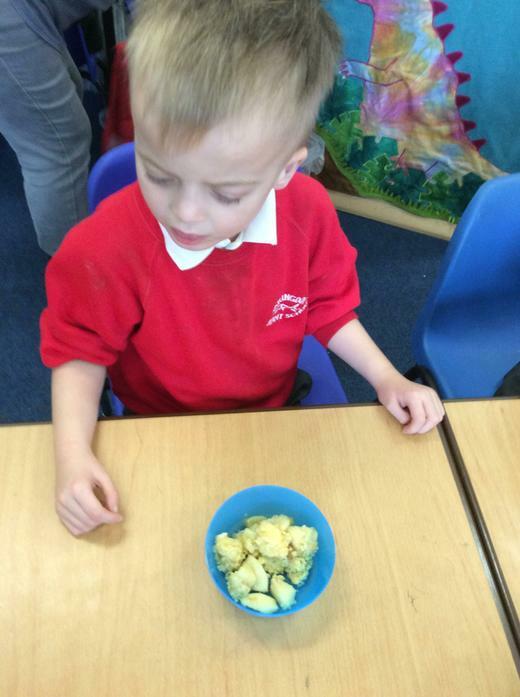 Oh it is a bit smelly. 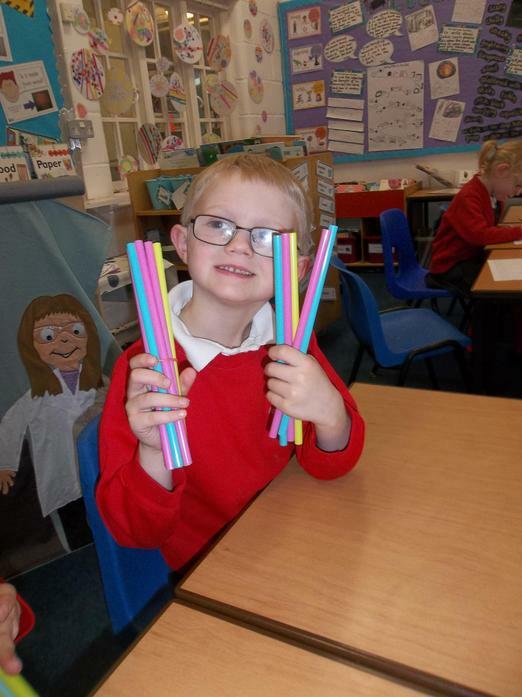 We all shared our ideas.